Have you ever considered investing in stock sectors? Here are some thoughts on the phenomenon called sector rotation. While many long term investors may dabble in some level of sector investing for the purposes of diversification, perhaps by using sector specific mutual funds, ETFs, or even individual stocks, others may prefer to introduce some degree of market timing in the picture. These are investors who want to take advantage and exploit changes in market sectors over time, with the goal of possibly beating the market. There are a few ways to address stock sector rotation, which we’ll discuss below. One thing that the professional money managers and investors are always looking for is a bargain. They don’t often buy at the high end of a stock’s range. Some of these professionals watch for otherwise good companies that have low stock prices or whose stocks have fallen out of favor. The same thing happens with sectors. If a sector looks like it’s underperforming the other sectors of the economy, this could signal a buying opportunity and professional investors look for those. Let’s look at a chart. Figure 1. Sector Rotation. Please click the image for a larger picture. 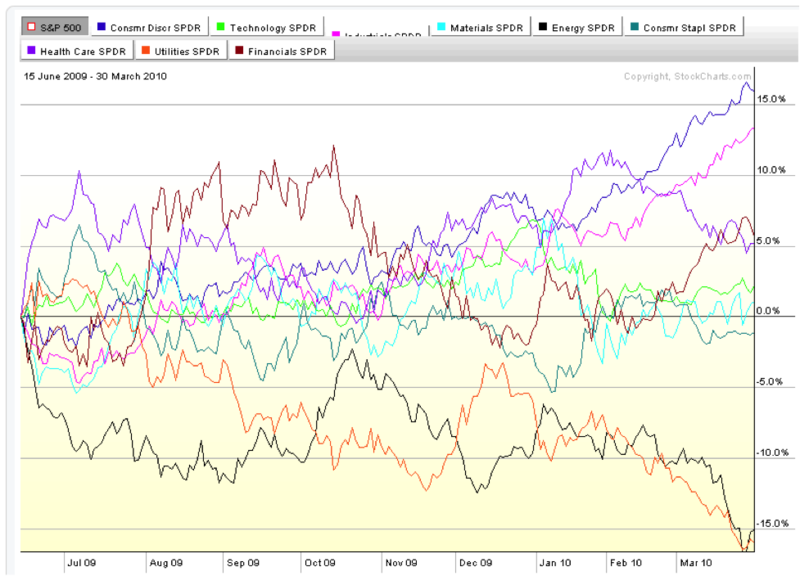 The above chart shows each of the Select Sector Spider ETFs’ performance, with the S&P 500 as the baseline. Each of these ETFs tracks a sector of the economy, and the graph shows their movement compared to the S&P 500. This chart is useful for showing which group of stocks showed the most growth in a certain period. In this case, the period of time is November 2010 to July 2011. 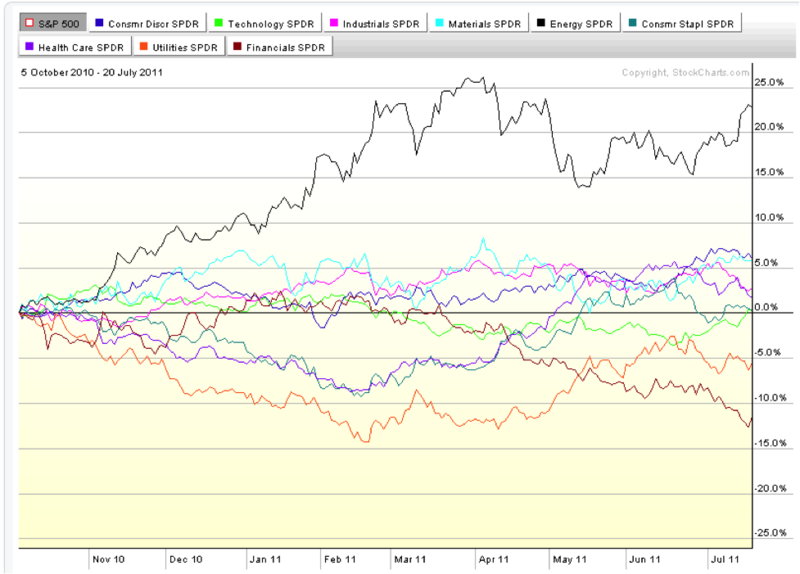 Energy stocks massively outperformed all sectors. At a 22% growth rate, energy stocks far outpaced the next best performing group, Consumer Discretionary stocks coming in at just about 5%. The worst performing sector was the Financials sector, which was down 11%. Although we’re not focusing on diversification, it’s important to note that a 33% spread in performance illustrates how important it is to diversify your portfolio. Although you may be happy with yourself if you were investing only or primarily in energy stocks, for reasons we’ll look at next, putting all of your money into one sector is a bad idea. Figure 2. Sector Rotation. Please click the image for a larger picture. Looking at the chart from July 2009 to March 2010, you wouldn’t have felt so confident about your energy investments for that period. By March of 2010, your energy sector names would have been down an average 15%! (Remember that these two charts are a weighted average of selected companies. Your energy sector names may have performed better or worse than what is represented in these charts.) This also tells us that in very general terms, if we look at the July 2011 gains of 22%, that’s an impressive but more realistic gain of 7% since March of the previous year. In other words, most of that 22% was about making up for previous losses. For additional information about these ETFs, check out spdrs.com and sectorspdr.com. Other sector ETFs exist under different names and may use slightly different benchmarks. Stock sector rotation is a phenomenon that takes place when groups of stocks (in a sector) collectively move in one direction vs other groups. Sector rotation is beautifully illustrated in the two charts we’ve provided above. Some investors refer to sector rotation as “the worst becomes first.” Big institutional investors would look at the chart that shows the slide in energy and smell a bargain. They lick their lips like a lion who sees its prey because what they see is a value investing opportunity. They see that the energy sector is down and potentially undervalued, and unless there is far too much oil on the market or every energy company in the world is the subject of a huge lawsuit, there is probably no fundamental or real world justification for this. When a stock group undergoes some kind of sector rotation, investors will be awaiting the opportunity and the right time to buy into that sector. Now what could be causing energy stocks to go down? One of those reasons may be the price of oil rising. This may be the perfect catalyst to start pouring money into the sector. When this happens, that sector that has underperformed eventually finds itself outperforming the others. At that point, the opposite happens. When larger investors see that a sector has seen big gains, they will take their profit and eventually short sell the names, which will cause the sector to most likely retreat to the middle of the pack. In certain cases or industries, there may be a predictable cyclical element in the way stocks behave, which may cause the sector’s rise or fall in value or popularity. 1. Consider taking profits. If you’re a conventional shorter term investor, you’ll probably want to consider taking profits. Then, you may want to stay away from overvalued areas until you notice or sense underperformance occurring again. This is a timing strategy. 2. Try advanced strategies. Short stocks or deal with put options. If you’re a little more aggressive, consider short selling or buying some put options that go out 3 months or more. This is a hedging and leveraging strategy. 3. Sit tight. If you’re a longer term investor, you should know that although these sectors will rotate, they will ultimately normalize and you’ll most likely see your profits normalize over the longer term. If you’re fairly diversified, you may want to stay put. This works best if you’re using a diversified strategy. 4. Learn about and use sector rotation ETFs. You can also capitalize on sector rotation. Investors who want to dabble in sector rotation don’t have to do it manually. As with any type of investment class, category or collection of stocks out there, there’s a benchmark that tracks rotating investments with an eye on “beating the market”. 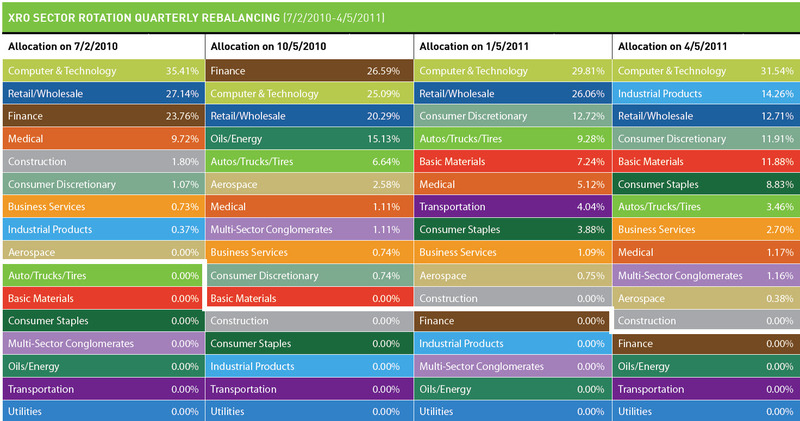 Following are some examples of sector or industry rotation investments. Do take note that some of these products may not sound as familiar as others. Guggenheim/Zacks Sector Rotation ETF XRO Zacks Sector Rotation Index (ZAXSR) Guggenheim/Zacks Sector Rotation ETF (XRO) used to be called the Claymore/Zacks Sector Rotation ETF before Guggenheim and Claymore Advisors merged. Powershares Value Line Industry Rotation Portfolio Fund PYH Value Line Industry Rotation Index (VLINR) In 2010, this fund was changed to PowerShares Morningstar StockInvestor Core Portfolio with the underlying index, Morningstar StockInvestor Core Index. Figure 3. Guggenheim/Zacks Sector Rotation ETF (XRO) Rebalancing Example. Click the image for a larger picture. As you can see, an ETF such as XRO does the job of “chasing” sectors for you. It is interesting to see how XRO is not entirely diversified across ALL sectors, with some sectors having 0% allocation, as the ETF decides to concentrate more resources towards certain sectors (e.g. it’s overweighted in certain sectors during different time periods). The tips we’ve presented here are just examples of what you can do when using sector investing strategies. You will need to decide how you want to act, based on your risk profile and investment time horizon. Remember that although the charts and tables above give clear examples of sector rotation, that doesn’t mean that an investor’s core strategy should be to time these rotations. It’s pretty difficult to time these events, so if you’re a small investor (e.g. long term investor), consider adding to a diversified portfolio by investing in a name that you like in that sector when the timing is right (especially when you see that a sector is underperforming). Or you may decide to use sector ETFs as diversifiers. Pretty interesting post about investing in stock sectors. I’m a newbie on the topic, so I didn’t know what is was before. Now I know. Learning something new every day :). Comprehensive piece about some interesting ingredients to introduce to one’s investments. I would be much more comfortable with investing in the general indexes. I’m talking about having the general market index represented in my portfolio, rather than investing in a collection of sectors. If I’m to invest in a sector, I would choose one or two to add to my positions. Those would be what I’m either most familiar with or what I am most interested in. Great post. Each week I review a series of different sectors and bond funds to monitor the rotation of the top sectors. By adding bonds to the mix, you end up seeing the move out of the market (market downturn) and into bonds. Keep up the great work! Thanks for letting us know about your site. I see that you track and follow rankings for Fidelity, Vanguard, Profunds and Schwab funds. It sounds like a great resource! I’d be interested to learn more about different rotational strategies.